The writers stepped their game up with this episode. I was impressed and I held on to every word. I actually hated having to deal with the commercials a bit more than usual. A lot of secrets were revealed and a lot of pain was remembered........as well as felt. The episode opens with a 22 year old girl's stomach bleeding. She begins hobbling into a room, trying to protect her 2 siblings by hiding under a bed. We find out that the the girl protecting the children is Jo and we see Kai walking back and forth as they watch, quietly, under the bed, attempting not to be caught. He lifts up the bed and the show officially begins. Let's go to Portland .... and discuss Steroline, openly. 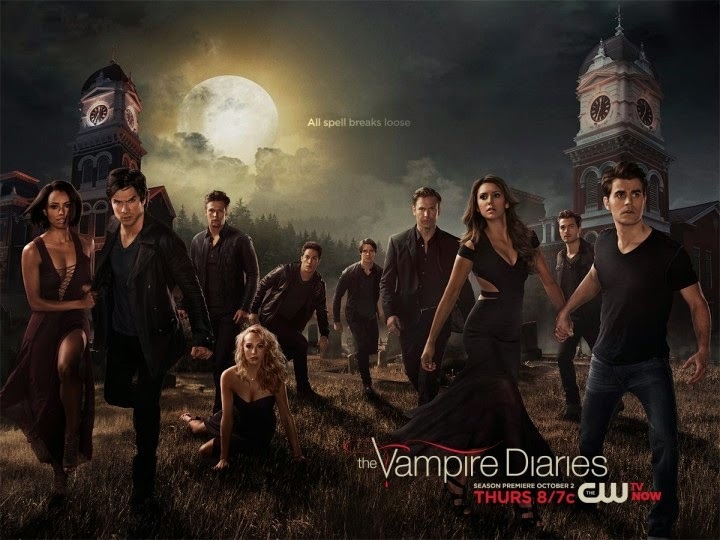 Damon, Stefan, and Alaric head to Portland, Oregon to Kai's house where he believes the ascendant (the thing that transported him to reality) is. Damon found Bonnie's bear last week and he knows that he can somehow save her. As they walk up to the area where Kai's house is supposed to be, Damon and Alaric begin discussing Caroline's Friendsgiving dinner (Thanksgiving with friends). Apparently Stefan wasn't invited. He was appalled considering Damon was invited and was even asked to bring string beans. They began teasing Stefan about how Caroline has feelings for him and how Stefan is always too into his own feels of life for him to notice. They walk up to this big field where Kai's house is supposed to be, but it isn't anything there. Because of irritation, Stefan ends up throwing Bonnie's bear into the field which appears to be nothingness, but suddenly a house appears. Of course, it was concealed with magic. Elena speaks to Stefan on the phone and he tells her that Bonnie can be saved. Elena is kind of upset with Damon about him not telling her.. He just didn't want her to get her hopes up. Elena asks Stefan how did he know that she could be trusted with his secret of being a vampire. He then tells her that he was in love with her which was why he knew she had to know. They discuss Caroline not inviting him to Friendsgiving and he tells Elena that she owes him dinner since she takes Caroline's side on this situation. I'm just going to kidnap you annnnnd make you dinner because it's Thanksgiving. Kai kidnaps Bonnie and drives her all the way from Mystic Falls to Portland. Mind you, she is in the trunk of his car though... He knows that it is Thanksgiving because he has been counting the days that he has been in that place. He seems as though he has turned a new leaf and decides to cook a Thanksgiving dinner for him and Bonnie. She picks up a pager on the table and he tells her to leave it alone because he needs it. He tells her that they can have one last meal together and them they can go their separate ways, spending their lives in that other world, alone. He also offers her his car as a gift. Riiiiigghhht. We're all related....because everyone's related on this show in some way or form. Caroline invited Elena, Jo, Liv, Luke, Tyler, and Liam, in addition to Alaric and Damon for Friendsgiving. We see Elena and Caroline talking while setting everything up. Apparently Elena does not want to compel Liam because she does not want to have to go through the trouble of making him believe anything she says. I suppose Elena is either trying to be moral or she is trying to not lie to him and keep the realness in the relationship. Liam enters and seems to be acting a bit kinder to Elena in comparison to last week's episode. Tyler attempts to talk to Liv, but she seems a bit reluctant even though still revealing loving stares towards him. Luke ends up showing a video of him and Liv as children at their birthday party. The person recording the video continues talking. Jo walks in and realizes that it is her voice. Everyone in the room finds out that Jo is actually their older sister. They also find out that Kai is her twin too. Jo begins crying as she stares at them because I'm assuming she either actually thought they were dead or hadn't seen them in years. We also find out the reason why Kai went on a rampage of trying to kill his siblings. When a person within the Gemini Coven births a set of twins, on their 22nd birthday they are suppose to either merge (absorb the other's powers) or fight to the death. Whoever wins becomes the head of the Gemini coven. How messed up is that? Kai and Jo were originally suppose to merge, but once the twins Liv and Luke were born they became the twins that would have to merge. One must kill the other. Liam hears everything and is extremely confused. Caroline compels him to leave the room and find a wine bottle opener. Liv, being extremely hurt and depressed, leaves the room. In this conversation we also find out the correlation to the Bennett's. Bonnie's Grams was the one that helped create the spell for the Gemini Coven and it was her blood that secured the spell. She also helped Jo, Liv, and Luke settle into their new lives which is why they were all at the same college so conveniently. Hey pops.... Can you give me the key to unlocking your killer son? As all of that is going on, we see Kai's (Jo, Liv, and Luke's) father behind the magical force field that was protecting the house. Damon tells him that he knows Kai and the father places a spell on Damon, himself, and the entire area the house was in to make them invisible to Alaric and Stefan. Damon is allowed in the house, but Stefan is not and Alaric can no longer see the house to even attempt to walk in. The father makes it clear that he doesn't want Kai to be let out of his prison. All Kai wants is power and he wants to be in control of everyone and everything. Kai has mental issues. Damon still asks for the ascendant, still not mentioning Bonnie. The father begins using magic on Damon because he thinks that he wants to let Kai out. Damon unfortunately doesn't even mention that there is a Bennett witch in the eternal prison that Kai is in and continues the charade of not making it known, but that's beside the point apparently.. The father begins creating some sort of spell by using a locket with Jo's picture in it. He places the locket in a bowl and it begins to melt. He then continues to kill Damon by bringing pain with the witch death stare. My dad's trying to kill me... I see where my brother got it from. Stefan and Alaric are confused about the disappearance of the father and Damon. Alaric talks to Jo on the phone as they exchange "I miss you's" and "I wish you were here's". He tells her that he is in Portland at Kai's house. She tells him that that is her father's house and that he will kill them. She finds out what they went there for and then tells him that the ascendant is with her, such a waste of a trip to Portland. While talking to Jo, she begins going through some changes involving excruciating pain which causes her to jerk, eventually cough up blood, and have a seizure. Liam and Elena are with her while this is happening. She tells them that her father is trying to kill her. Liam begins freaking out and wanting to use his doctor's skills, in addition to taking her to the hospital. Jo tells him to shut up, which was hilarious. The spell the father did with her locket was killing her. Elena grabs the phone and tells Alaric what's happening. Jo tells Elena to tell Alaric to find a tree trunk that's right outside her house. Under some leaves inside of the tree trunk was a knife......with her powers stowed away in it. Stefan throws the knife at the area the house was once in. The knife hits a post on the house and it reappears. Stefan runs in to save Damon and to kill her father forgetting that her father is a witch. He uses his powers to do a mind numbing vampire headache on Stefan and the father disappears. Let me feed our teacher some blood, tell you I'm a vampire, and break up with you. Jo's eyes turn completely red, which was EXTREMELY creepy. She was on the brink of death. Elena comes to the difficult decision of saving her teacher and letting Liam see her do so. She takes it upon herself to give Jo some of her vampire blood. Liam is basically bewildered and terrified, asking "What are you doing?" He watches her eyes change as she bites her arm for Jo to drink from. She heals and saves her, then begins explaining to him that she is a vampire. He barely responds because he is in shock. All he does is makes a face showing judgment, confusion, and displeasure. Elena tells him she cares about him, but that there is no place in her hectic world for him. She compels him to forget their entire relationship and he leaves. Jo watches silently and feels bad for her. As Damon, Stefan, and Alaric begin to hop in the car to go back home... Damon discusses how they must do anything possible to get the ascendant from Jo. Alaric firmly states that he doesn't want anything to happen to Jo because he's his girlfriend and he also believes that they can find another way to rescue Bonnie without the ascendant. Damon goes on a rant about how they have only been on 3 dates and compels Alaric to do whatever possible to find out where the ascendant is so that they can save Bonnie. Stefan, of course, gives his famous moral glare and Damon explains that it is the only way to get Bonnie back. Stefan removes the glare and agrees with Damon's decision. So this is what really happened to me in '94 and this is what's going to happen to you now. Kai finishes cooking the Thanksgiving meal and eats for about 45 minutes. He tells Bonnie the true story of what happened. Kai ripped out his sister's spleen and wanted her to tell him where the other set of Gemini twins were (their little brother and sister). She protected him and that pissed him off. He came looking for them. We see the beginning scene of this episode again where Jo, Liv and Luke are hiding under the bed. He lifts the bed up only to find Jo. He asks where the twins are and she says she doesn't know. He begins kicking her and destroying her insides. The magic she placed on the twins to conceal them wears off as she is being attacked. Kai sees the twins run out of the room and begins to go after them. Jo tells him that she will give him her powers since there is an eclipse (celestial event) happening on that day. We then see her put a knife in the tree trunk underneath some leaves and she guides him to where their Gemini coven is. He believes that they are all there to see him become the leader of the coven. Jo and Kai begin saying a spell out loud. When nothing happens, she tells him to chant again. This time only he chants the spell. He questions why the coven is in the shadows and are silent. His father comes out of the shadows and begins chanting a curse to kill him. Kai walks outside near the tree trunk and tells Bonnie that when she transferred her magic into the bear, he realized that his sister transferred her powers into the knife. He absorbs the magic from the knife and tells Bonnie that he doesn't need her. Bonnie questions him and tells him that he still needs the spell, but Kai remembered the spell and he says that all he actually needed was her blood. He then guts her in the stomach and leaves her. When Bonnie wakes up, she begins wondering where Kai went. He sends her a pager message: "I lied." Bonnie runs to the driveway of the house. He took the car and there is no way for her to get home in time for the eclipse. I have no choice in my destiny or do I? Liv wallows in grief at the bar, attempting to pour herself a drink. Tyler shows up, telling her that Caroline wanted to apologize to her for everything that happened. Tyler wants to help her and console her, but she doesn't think he can help her. She ends up getting drunk and Tyler takes her home. He tells her to just live for her instead of the coven. She explains to him that she would love to just fall in love and be happy, but soon she will be 22, have to either die or kill her brother, and her coven will come looking for her. Tyler tells her that if she's in Mystic Falls they will not be able to harm her with magic and that they will have to go through him in order to take her away. She smiles and embraces his love. Caroline walks into her dorm building as Stefan is about to walk out. She made him a doggy bag. Stefan ends up telling her that he pushed her away the most out of everyone because she made it easy for him to be vulnerable and just cry. Caroline values it deeply, as we see her eyes light up with joy. Stefan attempts to continue talking, but Caroline cuts him off and says it's okay. She smiles at him with some love in her eyes and walks away. Stefan stands in the hallway wanting to say a bit more. I'm trying to get Bamon back and that slightly makes me attracted to you. I'm single by the way. Elena walks in the bar and sees Damon drinking away his sorrows. They begin having a friendly conversation, but we can all see Damon's lovelorn eyes yearning for Elena. She begins asking him about what him and Bonnie did in the other reality. He tells her that they annoyed each other and talked a lot. She asked what they talked about and he says with his loving eyes "What do you think?" She knows. He tells her that Bonnie sacrificed herself for him. She listened to him talk about Elena for 4 months and she wanted him to be happy with her. He doesn't tell her that though. She tells him that she broke up with Liam and that she doesn't know if she should be happy and have the greatest life she could ever want or do something else...maybe a possibility with Damon perhaps even though it is not mentioned. She asks Damon to help her get her best friend, Bonnie, back so that she can ask her what she thinks would be the best idea. She grabs his hand and he agrees. Firstly, Enzo, Matt, and Jeremy were not at Friendsgiving. Enzo had been there for Caroline when Stefan went on his rampage, but maybe she didn't want him being reckless. He was probably off trying to hunt down Matt's friends. Matt was probably still upset about Tripp being killed (last week's episode). Jeremy has just been missing in action since this season started, but he probably didn't want to be involved in festivities anyway since he is still mourning Bonnie. Also, why didn't Caroline invite her mother? She has no one to share the holidays with. She's technically unemployed and wanted for dead by Tripp's vampire hunters. In the commercial for the next episode we see Damon and Elena focused on getting Bonnie back. We also see Damon and Elena having a moment on Kai's home porch. Damon tells Elena that they can create new memories that will be better than the ones before. Elena seems a slight bit willing to try. Delena seems like it can be brought back to life. So I know that a lot of people are happy about that. The Gemini coven will be everyone's enemy now... The father most likely told the entire coven that someone is trying to break Kai out of his eternal prison. That is definitely going to be an issue. Liv is going to stand up for herself. We've seen in the last season that she has a ton of power. She is definitely going to give the Gemini coven a run for their money. I also feel like her, Luke, and Jo are going to team up and obliterate them. I kind of feel like Luke is going to die though. He'll probably be murdered...unfortunately. He hasn't been given any big role yet and we don't know how he feels about the merge situation either. He seems okay with it.. maybe too okay with it. I wonder about the mother of Kai, Jo, Liv, and Luke. I suppose we are going to eventually find out what happened to her. Maybe she is the head of the coven? Bonnie is going to escape the prison eventually, which is when we'll see more Jeremy again. Kai is going to get back to reality or at least try to and the Gemini coven maybe waiting for him when he gets there. I do not understand why in every episode of the Vampire Diaries a simple statement or action could have been made that was obvious to resolve certain issues. Last week, Bonnie could have went home. On today's episode, Damon could have simply told the father that there was a Bennett witch in Kai's prison. I'm sure he would have helped them out since Bonnie's Grams helped them create the spell to trap him. Alaric and Jo's relationship is about to be messed up. Damon compelled Alaric to get the Ascendant by any means necessary, which is going to put a strain on their relationship or end it. Jo is probably going to feel like he's using her. The same way she felt Kai was trying to use her for her powers. I guess they're really trying to make Stefan and Caroline happen. It really seems that way, but I am not for it. Stefan has not clearly stated that he feels the same way about Caroline. I kind of think that he sees her as just a close friend though. HOWEVER, I did see a glimpse that Stefan is still in love with Elena. His feelings are buried somewhere deep inside him. I don't know if you guys saw it, but I feel like I did.. The conversation he had with her on the phone showed a slight glimpse into some sort of love. I want to declare it as though he is in love with her, but he could just have love for her. All we know is that sometime this season we are going to see them go out to dinner... I'm hoping. Of course, it won't work out because Damon is in love with Elena. Throughout this entire series I feel like both Stefan and Damon were given the short end of the stick, but mostly Stefan. They both fell in love, but Damon became a vampire willingly whereas Stefan didn't want to. Damon made Stefan's entire life miserable after the whole Katherine situation. Stefan didn't really even get a chance to be completely happy with Elena because something was always happening. Damon's past kept catching up with him. Damon fell in love with Elena....first. Both of them were selfless though. Stefan always cared about what she wanted whereas Damon always did what he thought was best for her. He met her first, but wanted her to have a vampire/witch free life, which is what made me truly like him. Stefan, on the other hand, wanted to meet her and know all about her. Damon then took it upon himself to antagonize the both of them for a while, but then Katherine caused chaos.. Klaus showed up and turned Stefan into a reckless person, while Damon and Elena fell in love. She became a vampire and became all Damon's. Stefan was heartbroken, ended up "leaving town", and began dying over and over again for three months at the bottom of the lake when Silas put him there, while Delena was getting it on. Stefan was still being put through pain while Elena and Damon were basically happy... Then Caroline showed up and was there for Stefan when he was going through all of this pain. Stefan has constantly had to clean up Damon's messes and be the responsible one. However, Damon has gotten them all out of a lot of trouble a many of times, but it was mostly for his love of Stefan and Elena. To be honest, I feel like Elena made Damon a better person whereas she kind of made Stefan worse after she started falling in love with Damon. Maybe I could possibly be okay with Caroline and Stefan becoming an item. However, this Elena who has her memories erased seems like the Elena I remember from the first season of The Vampire Diaries, which makes the possibility of her and Stefan getting back together by the end of the series increase. However, the Delena fan base probably won't allow it. I actually kind of liked Damon and Elena together, but the only thing I didn't like was the fact that she kind of removed her morals for him. I mean, maybe she was always like that and we just didn't know it until she became a vampire, but her morals were lacking before she lost her memories. Now she's just focused on helping everyone and having a good, long life. Amnesia Elena just seems like Stefan's Elena... I mean, when Alaric erased Elena's memories how did he actually reveal how her and Stefan officially ended things? They never focused on that point. I mean, Elena could still have feelings for Stefan, right? Regardless, I'm starting to think she maybe better off being alone or maybe Delena can happen... Steroline maybe happening, of course, I think that Stefan's feelings for Elena are the reason why he can't really like Caroline the way she likes him. But there's no point of focusing on Elena and Stefan right now. They'd have a few obstacles to get through if they were to happen again. What do you guys think?